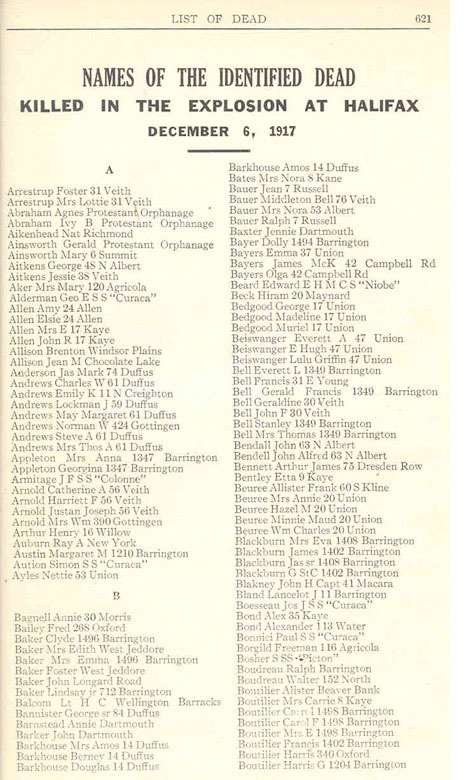 The Remembrance Book contains a list of the 1,951 people identified as having perished as a direct result of the 1917 explosion. Beside the name of each victim is listed the age and local residential addresses at the time of the explosion, in addition to their burial sites. The book is displayed at the entrance to the Museum's Halifax Explosion exhibit "Halifax Wrecked". Every two weeks a page is turned, ensuring that each name is displayed once throughout the year. A reference copy at the Museum is available for the public to consult. The book was presented to the Museum in 2002 by the Halifax Foundation. It started as an idea of former Halifax Mayor and Chair of the Halifax Foundation, Edmund Morris. The list was compiled by a team of researchers who reviewed all known records of Halifax Explosion victims. An online version of the book with all the names, plus additional information, is available from the Nova Scotia Archives: Halifax Explosion Remembrance Book.